My proposed project is titled A Common Source. 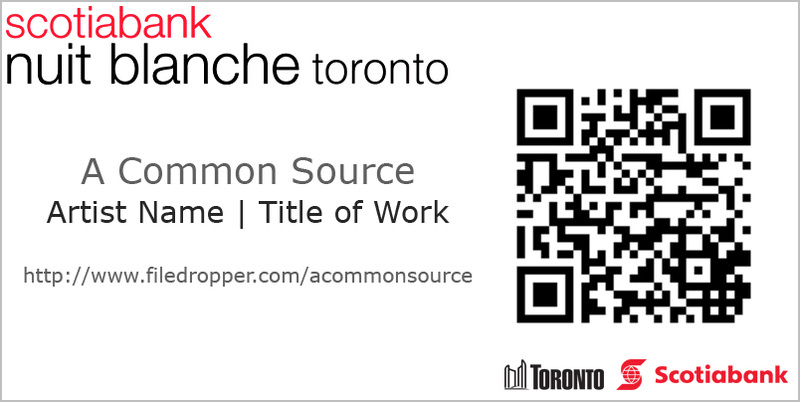 Working in conjunction with Nuit Blanche Toronto, this project would make the source code/media (images, videos, etc.) from the website for their 2016 line-up accessible to viewers. At each location of the festival, a tag will provide a link to a download site. There, viewers will be given a copy of all the documentation of that work used by the festival website, as well as the code for that particular page, and any logos, fonts, maps or other content found there. They will also be given the code/media for the site’s overall architecture (Home, About, Contact pages, etc.). Instead of a conventional copyright, as has been used previously, Nuit Blanche will put the entirety of their site under a Creative Commons (Attribution Non-Commercial) license, which allows for free use/remixing of content. The purpose of this is to question the perception of the internet as inherently public, as well as to challenge the regulatory (and monetizing/privatizing) nature of existing copyright law. What is the relationship between Nuit Blanche’s programming of public art, and the nature of its online presence? Do its copyright/data-accessibility choices reflect/promote publicity? The project will seek to make viewers question how they access creative content, and artists/arts administrators reconsider the context that their online presence enforces upon the work itself.